A manuscript style sheet is a critical tool for authors, editors, and proofreaders to use for ensuring consistency within a single manuscript or across a series. Traditionally, a copy editor creates a style sheet as they edit, and they pass that style sheet to the proofreader so they can adhere to the same conventions. Self-publishing authors who aren't using an editorial team will need to create their own style sheets to aid in their self-edits. But even if an author has an editor and proofreader in their corner, that author can still benefit from creating their own style sheet as they write and revise their manuscript. A style sheet helps to keep facts straight and thus save time scrolling back to lookup a detail while writing, and it can prevent the stress of having to untangle some conflicting issues in later drafts. A manuscript style sheet is also essential for tracking details across a series, where it then also serves as a Series Bible. So what is a manuscript style sheet? The document design and methodology vary from editor to editor, but all good style sheets track spelling and style choices that are specific to a manuscript, and they list recurring details and descriptions within that manuscript or book series. Invented words, spellings of all names and places, which conventions are being followed if there's more than one acceptable option (e.g. OK vs. okay), physical descriptions of characters and places, and worldbuilding essentials are all recorded. I'm a big fan of timelines, so that element is also a core part of the style sheet I developed. If you're following a style guide such as The Chicago Manual of Style, New Hart's Rules, or a publisher's house style guide, a style sheet will be used to take note of departures from, and issues not addressed by, the established guide. If you're not following an existing guide, then use the style sheet to take note of all style and punctuation decisions, such as whether the serial comma is being used, which type of dash should be used for parenthetical phrases (closed em? spaced en? ), whether there should be spaces either side of ellipses, and so forth. Below, you'll find a preview of the US version of my manuscript style sheet, which I created from the ground up. (My thanks to Beth Hill for advice on using alphabet boxes.) You're welcome to download my US or UK style sheet for personal use. If you share it with others, please give credit to Romance Refined as this document is protected by copyright. I've listed a few generic examples so you can see how I fill out each category. For certain details, you'll see I copy and paste quotes straight from the manuscript. This is a big timesaver, and it means I can use Word's "Find" feature to locate those specific words in the manuscript if I later need to change something. Quick tip: I've applied heading styles to each section of the style sheet. If you keep the Headings tab of the Navigation sidebar open, you can click the data entries listed there to quickly jump to an area when you need it. Much faster than endless scrolling! Keeping the Headings Navigation menu open is also a timesaver for checking at a glance to confirm the spelling of character names while you write and edit without having to actually go to that area of the document. 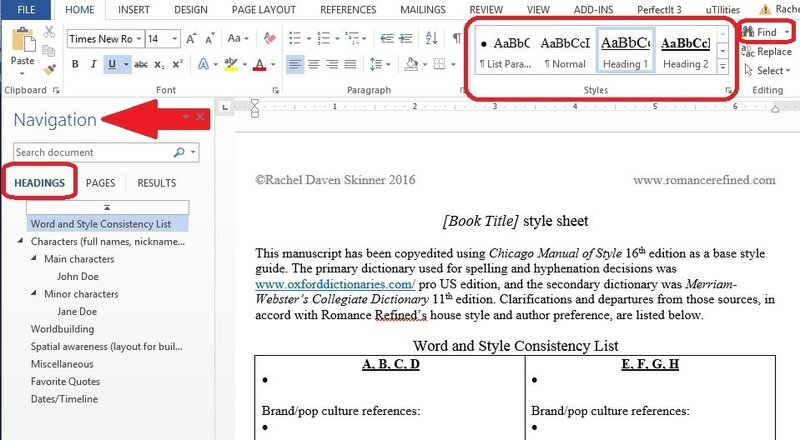 As you add your character names and additional sections, apply Headings using the Styles area found on the Home menu of Word's toolbar.